You'll receive this task from Thulgar in the Endless Paths of Od Nua, Level 3 (#1). Thulgar will tell you that his fellow ogres have succumbed to madness, and that they're now eating each other to survive. He'll then ask you to defeat Zolla the ogre chieftain, who is at least partially responsible for what has happened. 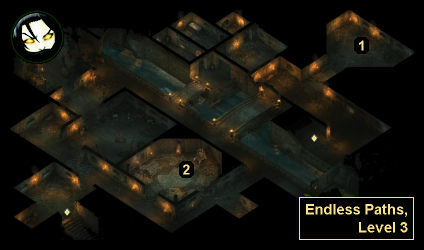 You'll encounter Zolla on the other side of the level (#2). She'll have a few ogres with her, including an Ogre Druid, so once the ogres turn hostile, you should immediately retreat. Zolla will probably follow you, but the druid might stay behind. If the druid follows as well, then you should target it first, or else it will heal its fellows faster than you can hurt them. When Zolla dies, she'll drop Zolla's Torc. When you hand over the torc to Thulgar, he'll reward you with Rundl's Finery, and then he'll leave the Endless Paths, never to be seen again.